One of the truly fabulous Canadian travel experiences is to ride the BC Ferry across the Strait of Georgia, the body of water that separates Vancouver (on the mainland of Canada) from Vancouver Island, 24 nautical miles away where the treasures of Victoria, Nanaimo and Pacific Rim National Park - and much more - may be found. 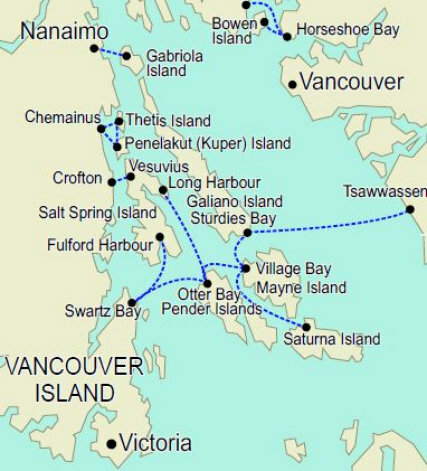 The trip from the ferry terminal at Tsawwassen (15 miles south of Vancouver) to the terminal at Swartz Bay - on Vancouver Island (17 miles north of Victoria) - is a spectacularly scenic and enjoyable 90 minutes that winds through the Southern Gulf Islands as it nears Victoria. Or do the trip in reverse starting from Victoria. The ferries carry cars. Consult the BC Ferries website to obtain schedules, costs, and tips... like buying a guaranteed passage on those busy weekends when you cannot afford the possibility of a 2 hour delay if you hit a big lineup and miss a ferry.